West End Restaurant in Waveland is sure to impress diners! The newest restaurant to be review by Coastal90.com is West End located on Highway 90 in Waveland, MS. It opened on Friday, June 13, 2008 and has been going strong ever since. I have been to this restaurant on more than one occasion and the food is always great! For starters, the wait staff is very friendly and eager to serve you. The building is beautiful. It’s got a comfortable New Orleans feel with it’s tall, slender windows and brick walls. West End also offers a fabulous patio area for alfresco dining. We ordered two dishes, the Veal Oscar and the West End Burger! Oh my…this was heavenly! Let’s start with the Veal. It’s panneed veal on top of a bed of angel hair pasta with lump crab meat on top of that. It was pair with asparagus and hollandaise sauce drizzled over the top of it all. Is your mouth watering yet?! It was so flavorful. I didn’t want the meal to end! The second dish was the burger. A cheeseburger is a must have on any restaurant menu. The West End Burger is dynamite! It is NOT a frozen patty. They make the patties in house and with love. If you like cheeseburgers, you won’t be disappointed with this huge hunk of meat. It’s served with the traditional lettuce and tomato toppings with french fries on the side. West End has a very diversified menu. They have it all – salads, crab cakes, poboys, gumbo, crab bisque, oysters (anyway you want them), seafood platters, prime cut steaks, chicken, pastas, veal & burgers. The only problem is deciding what to eat. It’s all so good! The restaurant has daily lunch & drink specials and a kids menu. You can check them out on Facebook to stay connected with the daily specials. 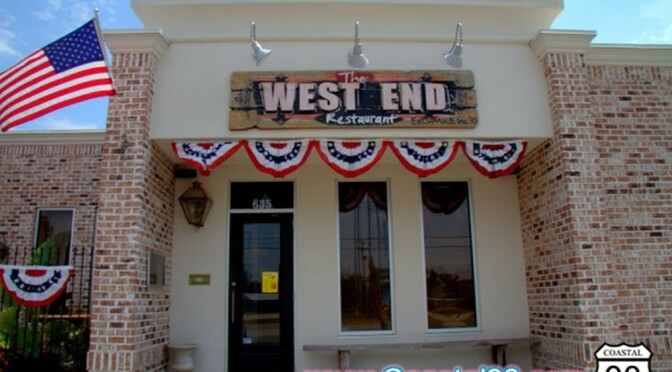 The West End Restaurant is one of Waveland, Mississippi’s finest dining establishments. They are open for lunch and dinner 6 days a week. Closed on Mondays.